A new infrared instrument for ESO’s Very Large Telescope (VLT) with 24 robotic arms has crossed the Atlantic from Edinburgh in the United Kingdom to ESO’s Paranal Observatory in northern Chile. When installed later in the year it will address, in more detail than ever before, some of the key questions surrounding the formation and evolution of galaxies. 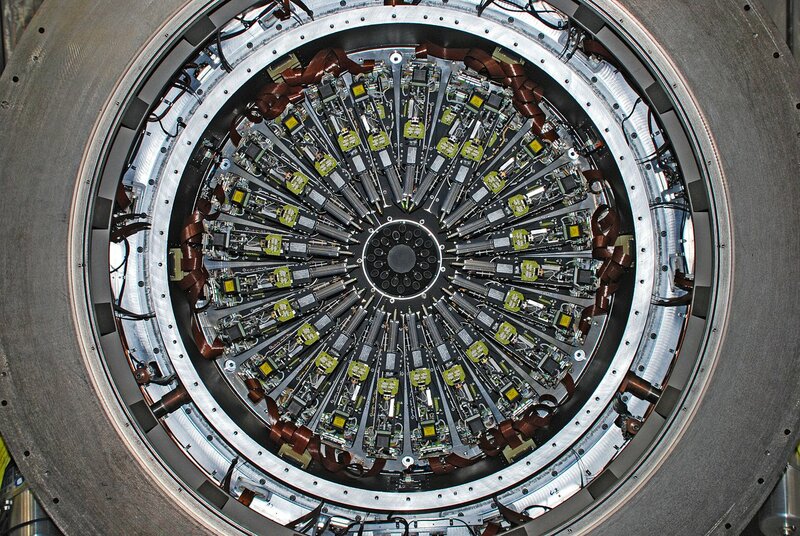 KMOS (K-Band Multi Object Spectrometer) has been provisionally accepted by ESO after it had completed final assembly and testing at the UK Astronomy Technology Centre (UK ATC) in Edinburgh. It will now be fitted to Unit Telescope 1, one of the four telescopes that make up the VLT, and will provide astronomers with a far quicker way to uncover details about galaxies and their properties. KMOS is unique in its ability to image many galaxies simultaneously, either in a cluster or in isolation, but in both cases to also map out the varying properties of different parts of each galaxy. Until now, each galaxy has had to be identified individually to obtain that information, a process that takes years. KMOS will be able to collect the same amount of information in just two months. Each of the 24 cryogenic robotic arms, which have gold-plated mirrors on their tips, can be moved into position to pick up the light coming from distant galaxies. KMOS has been designed, built and tested by a consortium consisting of Durham University (UK), the Max -Planck­-Institut für extraterrestrische Physik (MPE), Universitäts Sternwarte München (USM), Oxford University and the UK Astronomy Technology Centre. ESO itself delivered the detectors and other components. The instrument will be commissioned in November 2012.